This is my accidental shelf! 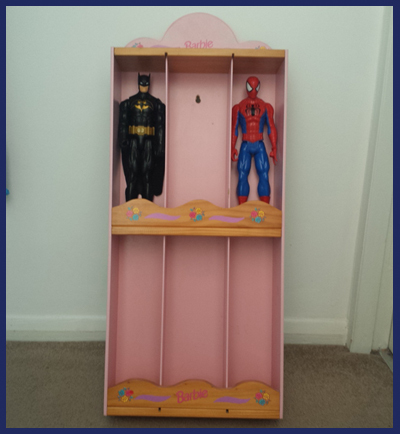 What I mean by that is I had no intentions of buy the Barbie shelf when I saw it at the car boot sale. I did stand in front of it contemplating whether to purchase it or not but decided I had WAY too many part projects at home so went to walk away only to have the stall owner say - it's only £1.............I stopped in my tracks turned around and bought it....... I know right! 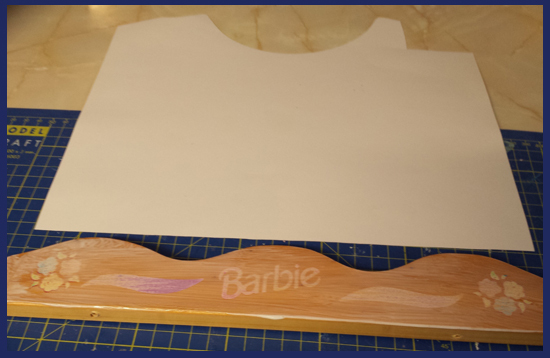 After looking the shelf over it became apparent it came apart rather nicely, and the Barbie logo sanded down well too, not that it mattered in the end as I covered it with spider paper! Hmm not a fan of wavey lines I found out! 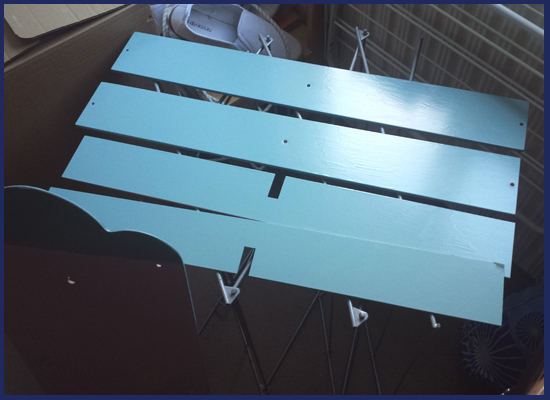 The sides were easy to paint and I decided to continue to use my Dulux - Made by me paint. I love this paint, it goes on so well but I need to start buying other colours though - well, maybe more shades of blue at least! Painting all shelving sides before I decided not to use 2 of them. 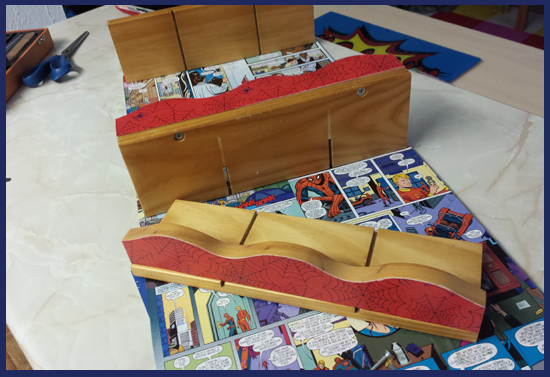 After a lot of deliberation, I finally decided on comic book pages for the background. I used whole pages so the story could be read and actually make sense. 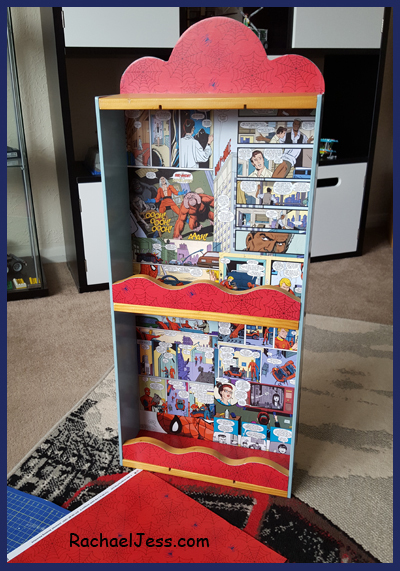 Armed with my Spider-man comics and my faithful Mod Podge, this didn't take too long to do at all, and I have to admit I do feel the effect is rather good! 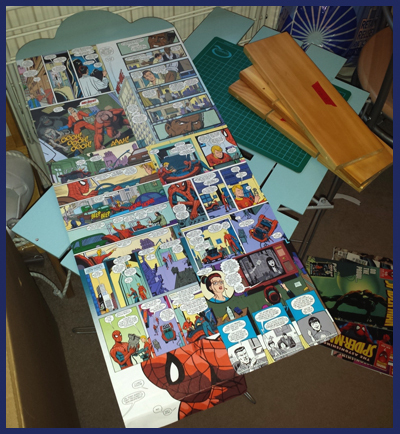 Once the background was dry, the shelves were recovered and the sides painted it was just a matter of screwing the pieces back together. 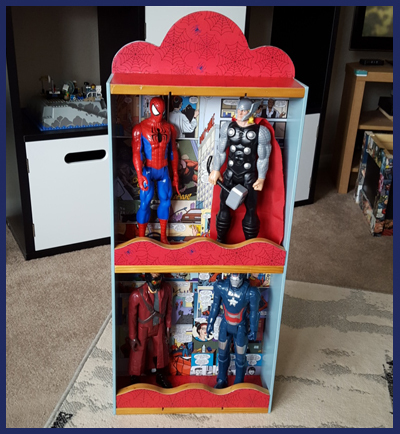 You may notice that I left out the middle sections as the men are just more stocky than Barbie - I'm mainly talking about Thor and Hulk of course! I have one very happy Marvel fan - oh and Max likes it too! 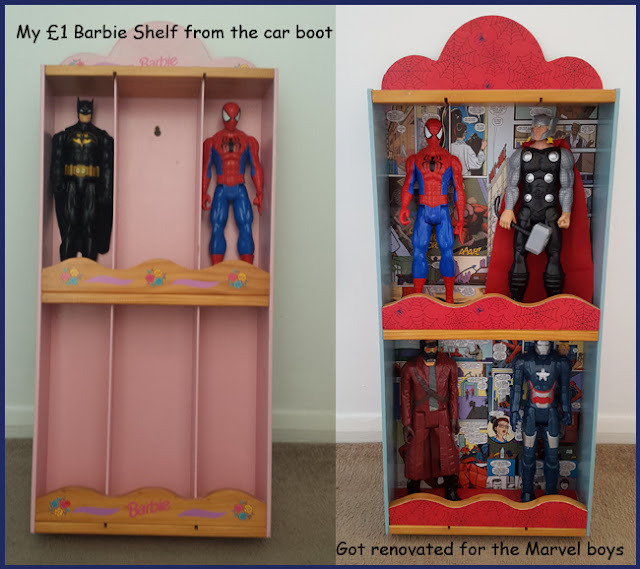 My £1 car boot bargain - what do you think? Have you got a great bargain piece from the car boot recently? 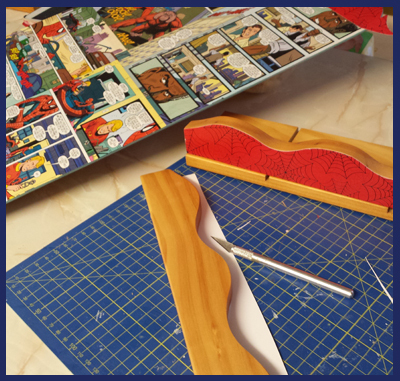 That looks ace, you have such a good eye for things that you can make to look fab! Letters with a wallpaper covering? Or add holes and put fairy lights through it?